One of the hallmark foodie experiences of my life occurred in a gas station deep in the heart of Louisiana. I walked into a side dining area crowded with community-style picnic tables with rolls of paper towels and bottles of hot sauce placed at their centers. I walked out (or rather rolled out, I was so full) with the solemn vow that this might have been my first Cajun shrimp boil, but it would not be my last. 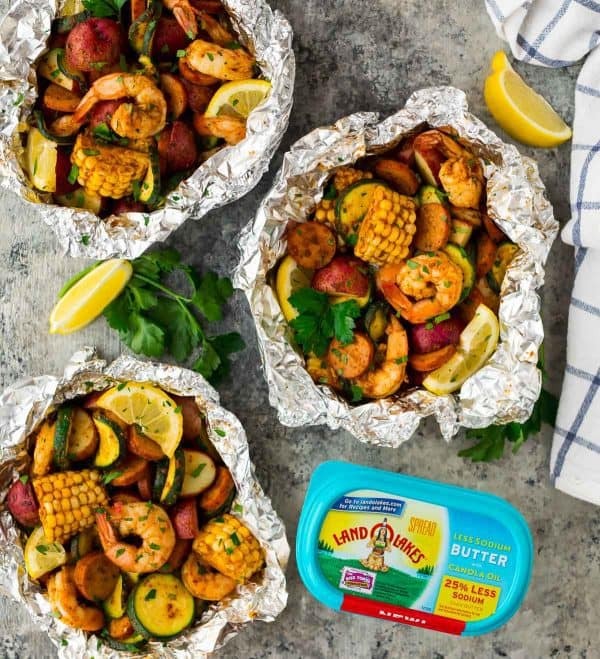 Today’s easy recipe for Cajun Shrimp Boil Foil Packets is my at-home version of the shrimp boil I experienced in Louisiana, tweaked to use ingredients I can easily find at my Midwest grocery store (spoiler: we are fresh out of fresh…and frozen…and all other crawfish). I also adapted the shrimp boil cooking method to one that I can easily pull together on a weeknight. As its name suggests, a traditional Cajun shrimp and sausage boil recipe calls for cooking the ingredients in a ginormous stockpot, preferably outdoors. I kept the same outdoor component, but eliminated the stockpot in favor of easy foil packets. 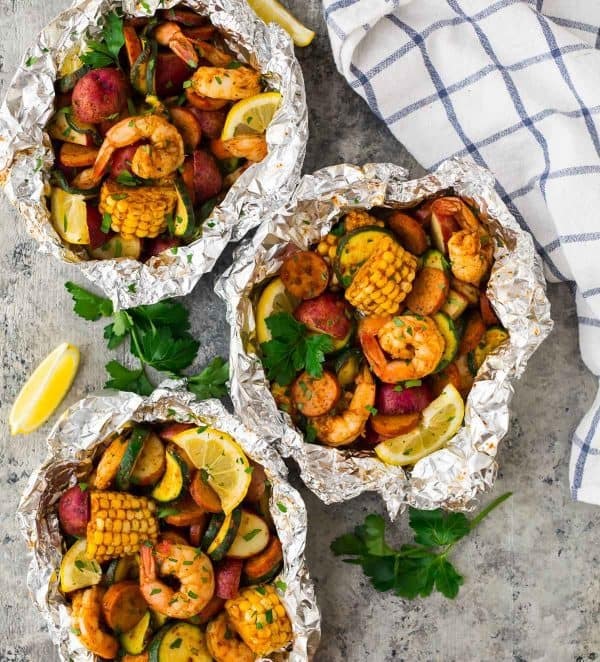 You can cook these on your grill with the same outdoor effect, or in the event of a) rain or b) you don’t feel like grilling/don’t own a grill, you can make this same Cajun shrimp boil in the oven, too. The Cajun shrimp boil seasoning is a combination of seafood seasoning and a Cajun seasoning spice blend I found at our grocery store. If you prefer a homemade Cajun shrimp boil seasoning recipe, my friend Robyn has one here. Every forkful took me right back to Louisiana. 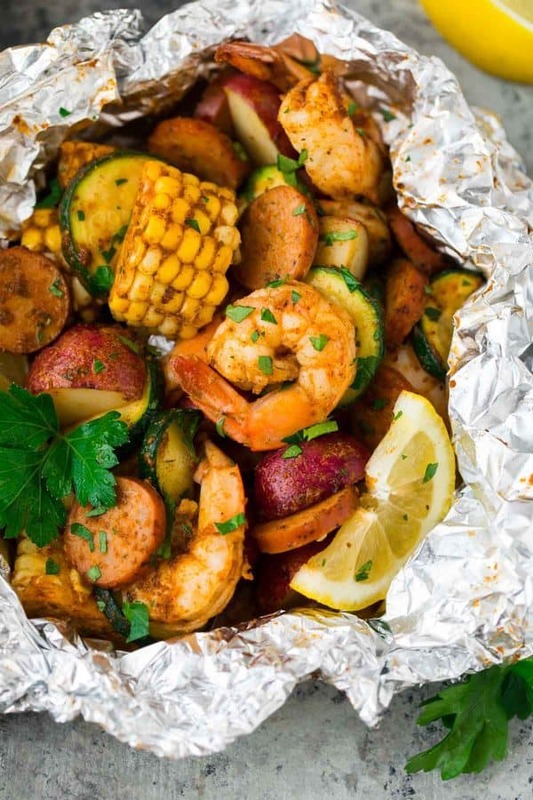 Keeping true to my usual better-for-you recipe approach, I made a few adaptations to these Cajun Shrimp Boil Foil Packets – notably, in place of regular sausage, I used Cajun-spiced chicken sausage. The foil packets have so many other flavors rocking inside them, this swap was completely undetectable. If you’re looking for a spicy Cajun shrimp boil recipe, using Cajun-spiced sausage raises the heat considerably. 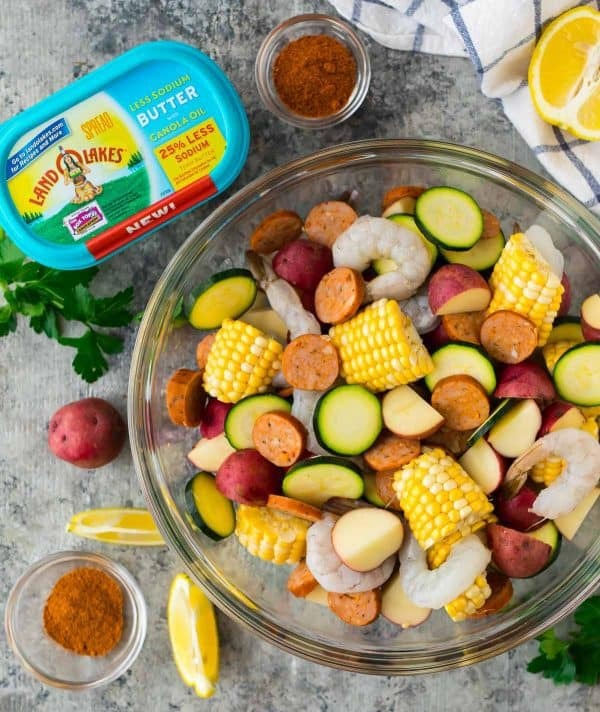 For a more mild Cajun shrimp boil recipe, I’d suggest Andouille sausage. Can’t find Andouille? Kielbasa is a close substitute and widely available (look for turkey Kielbasa). I couldn’t resist adding extra veggies to the Cajun shrimp boil. Along with classic corn and potatoes, I slipped in zucchini. Red bell peppers and yellow summer squash would be tasty seasonal additions, too. My final sneak is Land O Lakes® Less Sodium Butter with Canola Oil. It has the full taste of buttah (YUM) but 25% less sodium and fewer calories. I love how straightforward and simple the product ingredient list is! 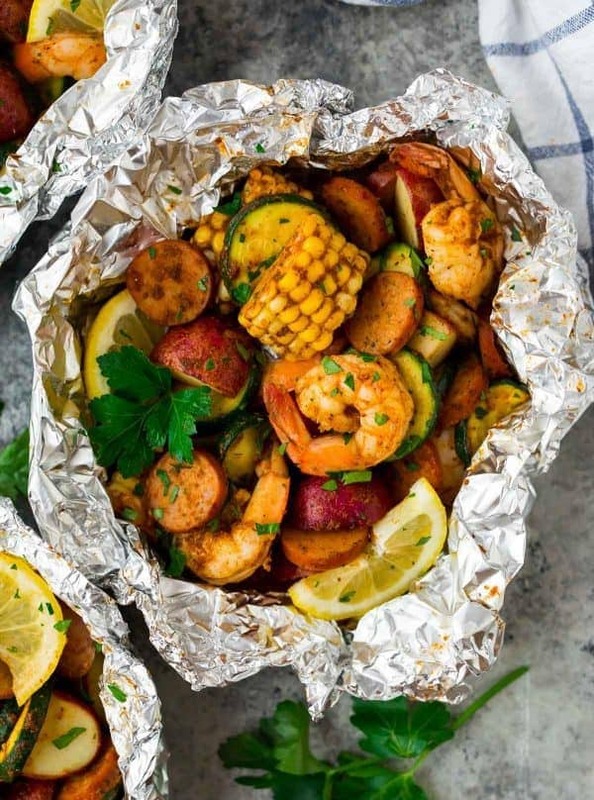 To make these Cajun Shrimp Boil Foil Packets, you simply stir together the ingredients in a big ol’ bowl, then divide them into foil packets and cook. This is easy summer living at its best. In the company of good friends, with your cool beverage of choice in hand. 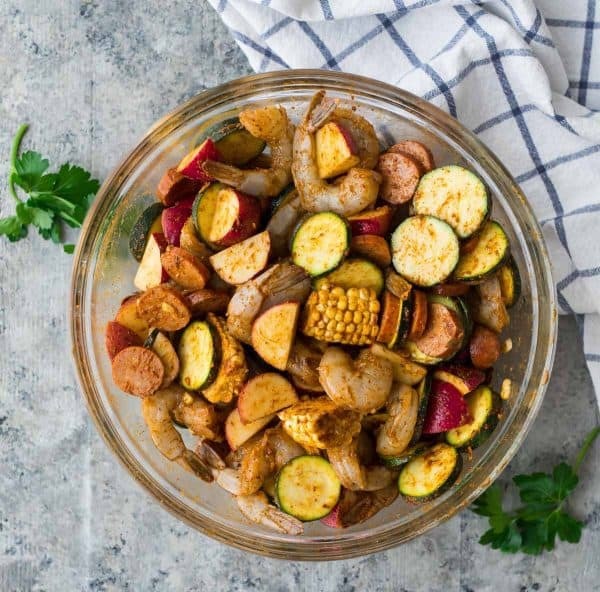 Easy Cajun Shrimp Boil Foil Packets with sausage, corn, red potatoes, and zucchini. Can be made in the oven or on the grill. Great flavor! In a large bowl, place the shrimp, sausage, zucchini, potatoes, and corn. Add the melted butter with canola oil, Cajun seasoning, and seafood seasoning. Toss to combine. To grill the packets, preheat an outdoor grill to medium high. To bake, preheat the oven to 400 degrees F.
Place four large (about 16x12-inch) pieces of heavy duty aluminum foil on the counter. Mound the shrimp and sausage mixture in the center of each piece, dividing it evenly between the four. Bring the shorter edges to the center, then fold them over each other to make a seam in the center. Fold in the edges to seal so that you create a packet. Leave some space inside of each packet for air to circulate. Place packets on the grill and cover. Grill for 10 minutes on the first side, then flip and continue grilling for 5 additional minutes until the shrimp is cooked through and the vegetables are tender. To bake, place the foil packets on a rimmed baking sheet. Bake for 15 to 20 minutes. Carefully open the foil packets. Serve hot with a sprinkle of parsley and lemon wedges. These foil packets are best enjoyed the day they are made but can be reheated gently in the microwave. Since shrimp tend to dry out easily when reheated, I prefer to keep these separate, then serve them chilled or at room temperature over a salad. Once you foil packet, you never go back! I hope you love this recipe and method! Mhmmm this recipe is literally taking me on a trip to Louisiana, and I love it! I’m dying to go back too! This looks so so good! Would love to have an authentic Louisiana experience some day! But this looks like a pretty close second! Love all the buttery goodness. Mmmm! Thank you so so much Liz! And I highly recommend adding it to your bucket list! This looks so delicious, and packed with flavor! I need to try this for dinner this week! Thanks and I hope you love it Liz! This looks awesome and I LOVE that it is all on the BBQ and no dishes!! No dishes is my favorite too Heather, thank you! This is making me miss Louisiana! I’ll never forget my first shrimp boil! It is an epic experience!! I need to try this, my boys would go crazy for them! I hope you all love it Matt! I wish I would have saw your page before the page I chose to follow, I wanted to add more veggies but I just followed their lead…. now I may have messed up along the way because it was supposed to take 15 min. Now I’ve had it on 450 and my halves of baby red potatoes are still hard. Toya, you mean this happened with a different recipe on a different site? Definitely give this one a try! I think you’ll enjoy it. I hope things go better for you next time! What a fun meal. I cannot resist shrimp! I am the same way Brenda! Don’t the potatoes take way longer than shrimp to cook? Hi Dustin! If you cut the potatoes small as described, they’ll all finish in about the same amount of time. Definitely don’t skimp on the chopping! Hi Sam! Is the chorizo pre-cooked? If yes, it will have a different flavor profile, but you can definitely swap it in! Just make sure you use some kind of precooked sausage that you can cut into coins (or you could buy chorizo in casings and cook it yourself first). For bake temp, see recipe step 1: 400 degrees F.
Thanks Erin – clearly too busy drooling to take information in. ? The flavor was amazing! The whole family loved this recipe. I will admit the potatoes were a little underdone, so perhaps we need to work on the size or pre-cook them a little. We also opted for one zucchini and one summer squash, which was a great change! This was a great all in one meal, so thank you. Lindsey, I am so thrilled to hear this was a hit! I’d chop the potatoes a bit smaller next time and you should be set. Thanks so much for taking time to leave this wonderful review! Erin! Another great recipe. I made a half recipe for just my wife and I tonight … cheated a little on the shrimp … used about 10 oz (14 shrimp) for the two of us. Scaled other ingredients back to approximately half of your recipe.. I also used your friend Robyn’s Cajun seasoning mix … took me about 5 minutes to make and it … was … wonderful!! The corn was a real bonus! I’m wondering if you could leave the corn in larger sections (maybe 3 inches or so) to make it easier to eat? It was tasty as it was, but such small pieces left you wanting a bigger bite! I used a mix of baby potatoes (yellow, red, and blue) and they were perfectly cooked using the 15/5 minute timing on a Weber Genesis grill heated on high and then set to hold about 450º F.
Dean, thank you so much for reporting back on the recipe, and I am so glad you enjoyed it!! The one catch with cutting the corn larger is that it might take longer to cook than the other ingredients. If you’d like bigger chunks, you could try grilling the corn separately next time. That would be delicious too! Another fantastic recipe here that I’ve tried. I also had problems with the potatoes being undercooked though, even after putting it back in for an extra 10 mins. They were diced very small. Perhaps boiling them beforehand would solve this issue? Mike, I”m sorry about the potatoes! I think boiling them first (just not all the way) would help. You could also put the potatoes in their own packets, give them a head start, then mix them with the other ingredients in the end. I’m glad you loved all of the other flavors and ingredients! Wow, this was absolutely delicious! Everyone enjoyed it. I added fresh green beans to the mix. So,so good! A new family fave! YAY!! The green beans sound like a yummy addition too. Thanks for sharing! My niece’s husband is from Georgia and has a low country boil for us when visiting in the summer. You nailed it! Easy and so good. Highest praise I could ask for!! Thank you Carol! Delicious and so easy! We loved it so much we made it twice in one week! Tanya, that makes my day, thank you!! No idea how yours cooked in 20 min. My shrimp was still half raw. Had to cook for 40min . Dan, it might have been the size of your shrimp or how tightly you wrapped the packets. Also, all ovens are a bit different, so that can influence things too. I’m sorry it didn’t go quite as expected! Thanks for reporting back, Diamond! I’m glad it’s a hit! I am curious why the potatoes show in the picture are not cut into .75 inch dice as stated in the recipe? The picture shows them to be at least twice the size…and likely could not be cooked in just 15 minutes. Please heal me understand. Hi Dennis, it may appear that way in the pictures, but 3/4-inch-dice is correct to make sure they cook all the way through! I hope you enjoy the recipe if you give it a try.